Planes packed with 800,000 Britons make the journey Down Under each year to take in Australia's famed natural beauty. But amid headlines of shark and crocodile attacks, are there a few hazards that visitors should be aware of? The sunshine, good life, beach culture and natural wonders make Australia the destination of choice for thousands of Brits. Whether it's the "trip of a lifetime", the honeymoon or one of the 40,000 year-long holiday visas used each year, the attraction is obvious. "The temperature and conditions, even in the winter months, it's still hotter than an English summer," says Australian Lynette Eyb, editor of backpacker magazine TNT. "The beaches and the East Coast have always been popular, Perth and Western Australia increasingly so. "Tasmania is beautiful for walking and the outdoors, the rivers and the forests down there. "You could spend years getting to know it and seeing it all." Emigration is set to step up. The Australian government this week launched its biggest drive to attract skilled workers since the "£10 Poms" took to their boats last century. As a result, the figure of 20,000 Brits a year emigrating is expected to increase to 25,000. With a shared language, common culture, good transport, peace, security and open people, Australia is seen as one of the easier sections of a round-the-world trip. But as the death of a British man this week - probably killed by a four-metre crocodile off the northern coast - illustrates, in the most extreme circumstances, that it can be a very hostile place. If confirmed, it will be the second such fatal attack within weeks in northern Australia, and record numbers of saltwater crocodiles have caused the closure of some sites in the Northern Territory's Kakadu National Park. The death happened on the same day an Australian surfer fought off a great white shark with his bare hands off the coast near Kangaroo Island in South Australia. "There are dangers wherever you go," says an Australian High Commission spokeswoman in London. "As you travel, you always have to be careful and look for warnings and signs." But there is plenty more to occupy the mind of a British visitor than they are used to in the flora and fauna at home. There are venomous snakes, spiders and fish, not to mention poisonous jellyfish, sharks and crocodiles. And the natural dangers of an intense sun and strong currents. Australians say this is no reason to baulk. Twenty million of them live there relatively unscathed and Aborigines have coped for tens of thousands of years. The dangers are exaggerated, not least by bragging Aussies, but tourists should be aware of them and use common sense, says Bob Cooper, a desert survival instructor in Western Australia. "It's always well-signposted where crocodiles are and you shouldn't go there," he says. 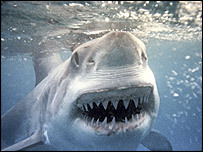 "Shark attacks are usually on people either swimming with seals or people in open areas where it's considered unsafe. "For the normal person going for a swim, they are not a consideration." Nothing in the wild will come out and bite you, says Mr Cooper. There are no deadly plants, unless eaten, and 90% of spiders and snake attacks are due to provocation by people playing with them. Anti-venom is very effective. "We have the top 10 venomous snakes in the world but you just leave them alone. I've been playing with numbers three, six and 10 today myself." Gardeners should always wear gloves because many spiders do bite and anyone picking anything or shifting rocks should take the same precaution. A far bigger killer to tourists is dehydration and heat exhaustion, says Mr Cooper. Two have died in Western Australia so far this year. "The big thing that gets to lots of tourists coming to work or visit is the vast distances between places and the heat. 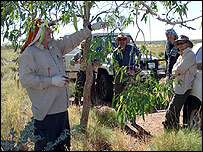 A lot of people suffer from no understanding that the Outback areas are remote. "People need to do their homework on survival techniques and not rely on technology because there are areas where nothing [such as mobile phones] works." It can take the emergency services three or four days to find stricken tourists, he says, and bodies have been known to lie for 10 days before anyone finds them. Key tips are to check the mechanics of the vehicle, take plenty of water and notify the local police before setting out, he says. I have lived in Australia for over 50 years, and sure there has been the odd jelly-fish, ants, sea lice and the like, but last year I was visting London, and at the Elephant and Castle market was bitten by a mite, and fell sick on and off for the next 14 months. Life is not safe, and worrying about it doesn't help. Live life instead. By far the biggest danger I experienced was the sun; my brother ended up in hospital as a result of not heeding warnings both from myself and local Aussies. Another tip: do not under any circumstances drive after dark unless in a sizeable 15+ seater coach. I had a nasty experience with a kangaroo at dusk and nearly crashed whilst doing nearly 90mph in the NT: please drive more carefully than I did. Ive lived in AUstralia for 9 years. I have seen 3 snakes and one redback spider in that time and I had to go out looking for them. On the other hand I am back in the UK for a month at the moment and got bitten by a badger last night in my mums garden. Nobody warns you about the vicious wildlife of Cheshire do they??? 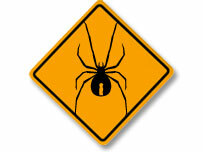 I live in Pheonix Arizona where we have Scorpions and Rattlesnakes and Blackwidow spiders. You adjust to the situation and never take risks. I have glass tumblers on each leg of my sons cot so that Scorpions can't crawl in. Also you have to wear gloves every time to place the rubbish out and garden. But on the upside life is good having over 300 days of blue skies. It seems like if you were told of all the gritters in the world that were dangerous, nobody would ever travel again. Australia is one of the most amazing countries I have visited and the Outback is an experience not to be missed. Just as when you cross the road, you check for traffic; before you hit the beach you take sun cream and a towel, before you "go bush" you check your gear. Having done the one year working visa I would say the biggest danger down under are the Aussie males and their egos when they lose the rugby, oh and the cricket! As an aussie i am sitting here chuckling about the comments made on Aussie sharks, crocs and spiders. I have just returned from two months in Englands concrete jungle. Give me aussie open spaces anytime. 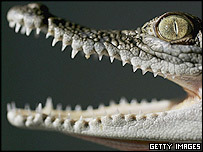 I respect crocs and sharks' environment and don't venture into their homes as I wouldn't go into the wilds of Africa. I have lived here for 56 years and have NEVER seen a croc or shark except in captivity. Give us a go mate. I know you will love it here as it's so much different to England. Light up the barbie, have a beer and relax. Cheers. Marlene Reid Melbourne Australia. I spent seven months in the bush of New South Wales and was confronted by various spiders, snakes and wild boars almost every day. The most dangerous being the king brown snake, followed by different types of black snakes all of which can kill. Whilst living and working in Sydney I also came across many funnel web, red back and huntsman spiders, it depends on where you are and what kind of job you do. The best way to stay safe is to be alert but not paranoid of the fantastic ozzy wildlife. I'm a prospective Brit looking to emigrate to Australia in the next year. Having been there three times I find it a far safer country than the UK. The fauna doesn't hold that many fears for me and my family, they don't for example have bears, wolves or big cats. In the United Kingdom I feel the biggest threat to my three year-old son is the amount of traffic and poor driving. With good sense and caution none of the nasties in Aussie can get you. Friends of mine came face to face with a Cassoway bird (I'm not sure of the spelling). This is the most dangerous bird in the world. Fortunately he knew what to do, stay still, stare the creature out and he put his bag on his chest for extra protection. His wife, at his request, hid behind him. Both were enormously relieved when this huge bird walked off. I have to say, though, that I was surprised this was not listed amongst your "Deadly Critters". The hysteria whipped up around these magnificent sharks has escalated since that stupid film 'Jaws'. The International Shark Attack File records ten fatalities in six years, whilst homicide rates in England and Wales in ONE year (2002/03) were 1,045. Shark attacks are horrific, but please keep a sense of proportion - you have far more to fear from humans. I am not going to Australia. I value my life too much. I don't want to wake up with a snake in my bed or a crocodile at my doorstep. No way. I'm sticking with Britain. I travelled round Australia this summer, and despite visiting some places off the beaten track my only encounter with a 'dangerous' creature was when i was snorkelling on the Whitsundays, in a stinger suit, and a baby jellyfish got me on the top lip, it hurt for 5 seconds and then it swam away. Two minutes later a white tip reef shark was but 20yds in front of me, it swam around me for a little while, got bored and swam away. The biggest danger in Oz is the cheap beer. I spent eight months travelling all over Australia, actively looking for some of the more dangerous animals. The most I saw were a couple of docile sand tiger sharks, a red back spider and some snakes in a zoo. You're more likely to get bitten by your neighbour's dog. I spent six months living in Queensland when I was younger, and despite seeing a number of nasty animals (a few snakes, tons of spiders inc red-back, huntsman and funnel-web, jellyfish inc box-jellyfish, some massive lizards inc blue-tongues) I never had any problems with any of them. The main thing I remember was being told to check under the toilet-seat for lurkers. Everyone is fairly laid back and there's lots of information available about the local wildlife, including some amazing wildlife parks and aquariums. Having spent a great deal of time in Australia the dangers are there but as long as you remain alert and have some common sense there is nothing to worry about. But saying that a redback got me last year !! I don't care HOW much they "Big up" Australia. I damn near have a heart attack just seeing one of OUR house spiders in the UK. I don't think my heart would stand the shock of seeing the likes of a Huntsman (sometimes as large as dinner plates!) skittering at high speed toward me. Sharks and crocs, who cares, but with the size and population of those spiders out there ... wild horses wouldn't drag me ON the plane this end ... let alone off it the other. Plus it's way too hot there. As an Australian living in the UK I can tell you Mr Cooper's comments and advice are 100% spot on. I've lived in many areas of Australia, mostly rural and country areas and have never had a problem with any spiders or snakes. People just need to be aware and they too will be fine. It is a different culture that the UK, where you don't need to shake out your clothes, shoes and jackets before putting them on, but you get used to these things. The people who get taken by crocodiles etc are those who swim in the infested waters without taking heed of signs or those who swim far out from shore are at risk of sharks. Stories are usually exaggerated. It's not as bad as it sounds, Australia is a beautiful place to visit or live. After spending a year in Oz and driving 22,000km around the outback, the only significant risk I found is the sun. It's easy to deal with: slip on some clothing, slop on suncream, slap on a hat... and drink plenty of water. Be sensible and you can enjoy a truly wonderful country. I spent a year in Australia, and only saw two snakes in the wild despite looking for wildlife everywhere I went. My safety tip is to look both ways when you cross the road. When I lived in Australia, we stayed above a garden shop in Sydney. A funnel web spider had made it's home in one of the plants on display in the shop. I was horrified and wouldn't go anywhere near it, where as our landlord was "looking after it" and "watching it grow". Such a strange race. I spent a year living and working in Australia after university and when I first arrived there we were told about the do's and dont's concerning the possible dangers there are and as long as you pay attention and use your common sense you'll have no problems at all. Australia is a wonderful country with so many great things to see and do. I can honestly say I had the best year of my life out there. Thanks for your comments. The debate is now closed.